Is It Better to Finish College Faster or Debt Free? Paying for college can be a juggling act. It can be difficult to balance the amount that you borrow with how much you work and how quickly you are able to graduate from college. If you are determined to graduate debt free, it may take you a bit longer to graduate, since you may be working full time and taking only a few classes a semester. And if you decide to attend school full-time, you may accumulate more in student loans, since you won't be working full-time. Consider the following as you decide whether it's better to graduate college more quickly or graduate with less debt. One of your options to graduate college with less debt is to work full-time and to attend school part-time. 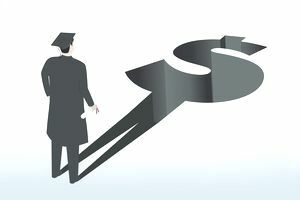 This may be a good option if you are already supporting a family, though you should consider how much your earning power will increase once you get your degree. If you are working, your employer also may offer to reimburse the cost of tuition for a certain number of credit hours each semester. In exchange, you may need to agree to work for them for a set number of years after you graduate. This may make attending school possible for you. Working while attending school can be a good option for some. But if you are not making steady progress toward your degree, you may want to cut back your work hours a bit and add a few more school hours into your schedule. Keep your current financial responsibilities in mind, plus how much you'll need to meet your other financial obligations. Be sure that you find a job that pays well, which can reduce the amount of time you need to spend working while covering your expenses. Look at alternatives to attending school during the day so you can work. Online options, night school, and classes that only meet once a week may be viable options. Be sure to take advantage of study groups at your college to help you balance both work and school. Tutors and study sessions can help if you are juggling a lot and trying to do well in school. Another option is to attend school full-time and take out student loans to cover your tuition and expenses. You may justify this by considering the timeline – if you attend school full-time, you will graduate more quickly, so the time you'll spend paying for tuition, books, and other school-related expenses will be less. If you decide to take out student loans to go to college, it is important to think about the return that you will make once you graduate. For example, if you are spending thousands of dollars on a technical degree that will have you earning $10/hour once you graduate, the investment may not be worth it. But if you are attending a prestigious master's of business program that will likely have you earning six figures once you graduate, it may be worth it. If you cannot work and go to school, try increasing your course load to speed up how long it will take you to graduate. Take the time to apply for scholarships and grants to help cover your college costs. Work on reducing your expenses. Be sure to live as cheaply as possible while in school. You may consider living at home to further reduce the costs. Consider working multiple jobs during the summer and saving up money to reduce the amount that you have to borrow each year. It is important to find the right balance for you. Some people have a difficult time working and attending college, so to balance things, they work multiple jobs over the summer and save aggressively to help lower the amount they need to borrow for school. Other students find that they can work part-time and take a slightly lighter courseload, while attending a few classes over the summer to keep them on track for graduation. Some semesters they may be able to increase their hours while planning on a lower workload during the last few semesters of school. There is not going to be a single right answer for everyone. A lot depends on your major, your expected earnings and the amount that you end up borrowing. As you make the decision for your individual situation, you need to make sure you are following a tight college budget, and that you are working on keeping your tuition costs down. It does not make sense to lose your full tuition scholarship in order to keep a minimum wage job. Speaking from personal experience, I know it is possible to juggle college and work. I was able to graduate with my bachelor’s degree debt-free. I had scholarships many semesters, and I worked while I was in school. It worked for me because I stuck to a college budget, and was able to attend a school with affordable tuition. I also finished a five-year program in four years, which helped cut costs.